Few habits are as good for your long-term health as running. You don’t have to go fast or for dozens of miles to get the benefit, you just have to do it! If you’re looking to start, there’s no better time than February. It’s Heart Health Month, the cooler temperatures are a blessing—and it’ll be Valentine’s Day soon, too! Okay, so going for a run might not sound like the most romantic getaway, but having a partner to go running with provides a constant source of encouragement, support, and definitely makes the miles pass by more quickly! Know your biomechanics. Every foot is a little different, and will behave differently during the complex sequences of motions required for each step. We can help you measure your biomechanics (whether you have flat feet or high arches, how much your foot pronates, etc.) so that you can use that information to get the right pair of running shoes, which are also critically important. We’ll also be able to tell you whether or not you might benefit from custom orthotics, and if so, we’ll fit and order them for you. A little more on footwear: once you find a pair that support your biomechanics, don’t get too attached! The cushioning and support on even the best running shoes will wear out after a few hundred miles. Stretch properly. This should be done gradually and gently without bouncing. Stretch a little each day (even if you aren’t running), to slowly increase your flexibility and range of motion. Also, always warm up for 10-15 minutes before going on a run. Start slowly. It’ll take time for your body, including your heels, to adjust to running if you haven’t done much in the past. Start with a small amount you know you can handle, then increase the mileage by no more than 10% per week. Don’t let heel pain be a barrier preventing you from running, increasing heart health, and enjoying an active lifestyle! 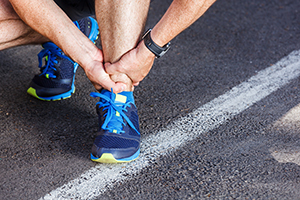 To set up an appointment with the team at Austin Foot and Ankle Specialists, give us a call today at (512) 328-8900. You can also order a free copy of our book, “Keep Running!,” for more detailed information on running injuries and how to treat and prevent them.